John Taylor, a 2006 member of the Capital Regiment color guard, sent this picture. It was my first season of drum corps and it was an amazing experience. I had always heard about how fit people are when they return from a summer tour, but I was skeptical. Well for all you other non-believers out there, here is photographic proof! 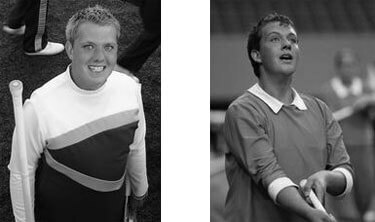 The first photo is me in my West Virginia University marching band uniform in the fall of 2005. The second photo was taken at the DCI Southeastern Championship in Atlanta on July 29. That was after I had lost 40 pounds thanks to what I call the "drum corps diet." Where else can you eat four meals a day, tons of junk food on a bus, and still lose a ton of weight just from doing what you love? Move over South Beach, DCI has the winning plan!